The progressive trajectory of procurement practices in the last few years have been something to marvel at. The back office spend centres of yesterday have blossomed into a strategic, supplemental business practice with a focus on driving process improvements, cost savings, and increased customer satisfaction. To continue this positive shift, many procurement leaders are focused on seeking additional enhancements in cycle times for the benefit of their business partners. This is integral because cycle time reduction can drastically improve turnaround time and the overall cost of the procurement function. It can also enable procurement employees to use more of their time for strategic activities such as building and managing supplier relationships. Purchase order cycle time is a key measure of procurement cycle time. This measure is calculated as cycle time in hours from the receipt of a purchase requisition line item to the purchase order’s transmission to the vendor/supplier. Such a calculation should include all activities associated with processing a purchase order as well as data input, time taken to confirm receipt by supplier, and time taken to respond with confirmation of pricing and delivery. APQC’s Open Standards Benchmarking® data in procurement illustrates that top performers are able to place a purchase order in five hours. 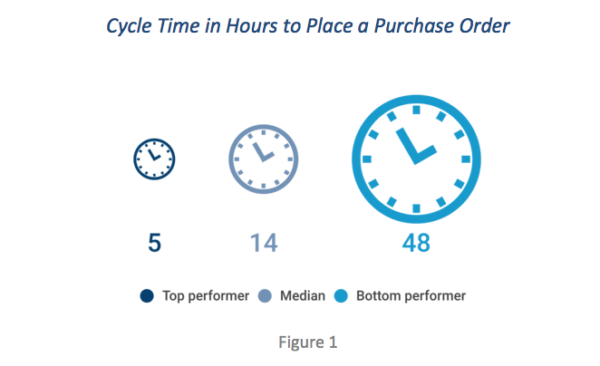 By comparison, bottom performers take about 48 hours to place a purchase order, more than eight times as long as top performers. But it begs the question – what can you do right now to improve purchase order cycle time? APQC has examined the procurement performance of organizations that have automated their ordering process compared to those that have not. There is a significant difference in PO cycle times between organizations that use a system (i.e., either a third-party system such as SAP or Oracle, or an internally-developed system) to perform the process “order materials and services” versus those that use only a manual or spreadsheet-based approach. 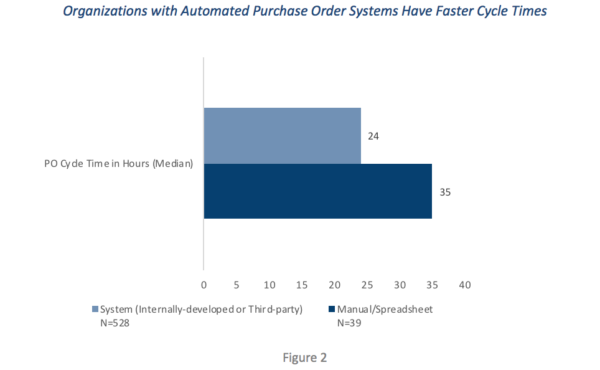 Organizations have that automated this process have a faster cycle time to place a purchase order (24 hours at the median) compared to those that use a manual/spreadsheet system (35 hours at the median). This 46 percent increase is not a small difference: it represents 11 hours of time per PO that could be put to more productive activities. As the size of the organization and typically the complexity of the purchasing process increases, manual procedures can become inefficient, requiring excess paperwork, increasing the possibility of error and redundancies, and lengthening cycle times. Automation can drive increased efficiency and productivity. However, it’s not as simple as just buying software. Before implementing new technology, APQC’s blueprint for success begins with establishing well-defined processes and removing bottlenecks. Then organizations should set clearly articulated measures to evaluate process performance. Once key performance indicators are in place with benchmarks to compare results before and after automation (and externally), successful organizations focus on understanding people, process, technology, and measurement practices that drive better performance. A critical success factor is deploying a robust change management plan to ensure employee buy-in before, during, and after the automation, considering changes to employee tasks and the need for adequate training. Procurement leaders are then better positioned to implement technology to drive maximum benefit to the organization. Another way organizations can improve their cycle time in procurement is through rationalizing the supply base. The ultimate goals of supplier rationalization are to create a lower-risk and more manageable supply base and develop stronger business relationships with critical suppliers, thereby reducing waste and achieving a leaner supply chain. Organizations rationalize the supply base by reducing the number of suppliers and prioritizing preferred suppliers. 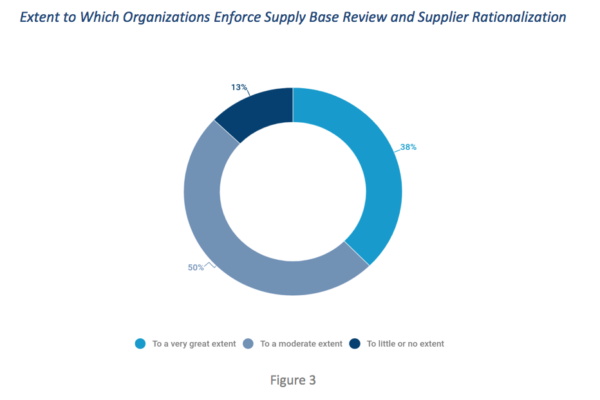 According to APQC’s research, 38 percent of organizations enforce processes for periodic supply base review and supplier rationalization to a very great extent. Most organizations apply at least some form of rationalization, with only 13 percent reporting that they enforce supply review and supplier rationalization to little or no extent. Rationalization forces organizations to categorize their spend and identify critical suppliers for each category. Many organizations reduce the number of suppliers in order to leverage buys, reduce costs, and free up buyers’ time for more strategic functions. By reducing the supplier base, fewer employees are needed to maintain day-to-day purchasing activities. Reducing the number of suppliers is not the only option in supply base rationalization. Organizations also can keep the same number but prioritize preferred suppliers. The quality of suppliers is more important than the number of suppliers. Poor performers can then be replaced with better ones to drive supply performance. Building closer relationships with top-tier suppliers helps reduce waste in the supply chain. Reducing purchase order cycle time is an essential step in the journey toward more strategic procurement. Through automation and supplier rationalization, it’s possible to free up staff to focus on higher-value activities related to supplier relationship management. Learn more about improving procurement performance in APQC’s Blueprint for Success: Procurement. Is There a Difference Between Spend Management and Expense Management?